The third son of John Wesley and Eliza Bullock Carr, Julian Shakespeare Carr was born in Chapel Hill, N.C., on 12 October 1845. John Carr was a prosperous shopkeeper on Franklin Street, the main artery adjacent to the University of North Carolina. With achildhood spent near the University, among whose faculty his father was well-respected, it seemed natural that "Jule," as his father referred to him, should matriculate there in 1862. In 1864, Julian Shakespeare Carr enlisted in the Confederate army, where he served with the Third North Carolina Cavalry. After witnessing the surrender at Appomattox, he returned to Chapel Hill, where he enrolled for the 1865-1866 term at UNC. Carr spent 1868 to 1870 in Little Rock, Ark., where he had entered into business with an uncle. Returning to North Carolina, he received four thousand dollars from his father to purchase a one-third interest in the tobacco manufacturing firm of W. T. Blackwell and Company in Durham, N.C. Business boomed, primarily as a result of the pioneering advertising campaign that promoted the company's product under its trademark, Bull Durham, which soon became a household word. Carr bought out his partners, only to sell the business in 1898 to the American Tobacco Company. With this captial, Carr engaged in a wide range of business interests: banking, hosiery mills, the Durham-Roxboro Railroad, electric and telephone companies, and a Durham newspaper. 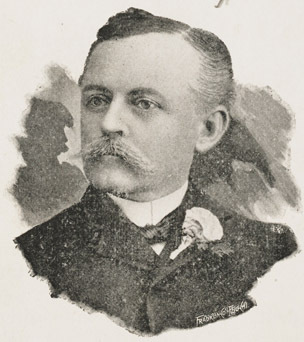 Successful in most of his endeavors, Carr was also said to have given away a fortune during his lifetime. To the Methodist church, the Confederate veterans, and the University of North Carolina, he was quite generous. A trustee of the University and of Greensboro College, he was also a benefactor of Davidson, Wake Forest, St. Mary's, Elon and Trinity colleges. As Commander of the United Confederate Veterans in North Carolina, Carr had the honorary rank of major general, and was often referred to as "General." An active Democrat, he supported the party financially and served as a delegate to its conventions, though he was never elected to office.